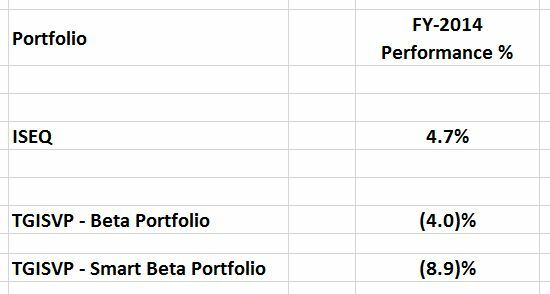 In the Beta Portfolio, a 6.3% gain from Aminex (AEX:LN) was a huge & unexpected tailwind (and the largest individual stock gain across all TGISVP Portfolios), but it was still swamped by other resource stock losses. In aggregate, resource stocks contributed a net loss of just over 3%. Otherwise, Aer Lingus Group (AERL:ID), NTR plc & Zamano (ZMNO:ID) were the main winners on the long side (across all Portfolios), but overall the non-resource stocks in the portfolio were mostly noise… The Smart Beta Portfolio did worse, which actually came from under-weights in the portfolio (rather than over-weights, as you might expect): Since I was only barely bullish on AEX, it was a far smaller holding in relative terms & contributed a much reduced 2.4% gain – accounting for most of the additional portfolio under-performance. Of course, it goes without saying…I wouldn’t actually dream of buying some of the stocks which I objectively consider to be under-valued! [But I have said it! Quite regularly, in fact – I’ve been careful to stress this important proviso to readers, particularly in relation to resource stocks]. Yes, it’s true, valuation’s always an essential hurdle – but ultimately, it’s only one piece of the puzzle when it actually comes to picking & buying stocks. – At this point – call it (personal) capitulation**, if you like – I’ve been forced to conclude a value investing perspective is basically irrelevant (& maybe even dangerous) when it comes to investing in junior resource stocks. [**Unfortunately, despite the carnage, I suspect we may still be trading well shy of total market capitulation in resource stocks…]. A genuinely undervalued resource stock, in terms of net cash and/or actual reserves & resources, doesn’t necessarily make a good investment – like other value traps, its market value may never converge towards its (perceived) fair value. [More often, fair value will converge to market value!] And it often lacks the funding/resources that are required to actually extract the value from its underlying assets. Granted, such a company may enjoy a (somewhat) better chance of attracting an acquirer – but in reality, the odds of being acquired are actually pretty low, as exploration licences are always going begging somewhere & larger resource companies usually prefer to acquire operational projects (since they invariably offer a superior risk/reward). Positive cash flow is also tempting, but: i) I don’t mean positive operating cash flow, I mean positive free cash flow – this may seem extreme, but in most instances I think it’s prudent to treat all exploration spending as basically worthless, ’til its value is actually confirmed (if ever) via a proving up of reserves/resources, or an actual sale, ii) how often do you come across junior resource stocks with positive free cash flow anyway? !, and iii) overall, I don’t think positive cash flow’s enough to ensure (let alone guarantee) an increasing market value…though obviously it can significantly relieve the selling pressure resource stocks usually tend to suffer from regular equity fundraising & a lack of tangible news/progress/profits. Actually, management might well be the best company-specific indicator of value (or lack of value!?). Look at directors & key management, and trace back their resumes & achievements. Mostly, this is an exercise in elimination – the record of perhaps a majority of junior resource company promoters & personnel is abysmal at best, egregious at worst…compounded by the fact operational success often doesn’t translate into actual financial success. But failure is soon ancient history & the media shows little interest in digging it up, people prefer to just remember the winners, and deceased company price charts, news & websites conveniently disappear. And you’ll never see a long-term junior resource stock index either – I mean, what broker wants to show you what that looks like?! So yes, it’s a tall order, but thoroughly investigating management is absolutely necessary if you want to know who you should avoid. And even more necessary if you’re hoping to identify the rare nag you should back – plenty of exploration success is simply down to luck, but it’s funny how often the guys who got lucky before…are the same guys who get lucky again! – Regardless of my thoughts on valuation, it was perhaps inevitable the absolute & relative performance of the TGISVP Portfolios would be dominated each year by resource stocks. They comprise nearly 40% of the TGISVP universe, and their sometimes extraordinary volatility is always likely to disproportionately impact performance & swamp the success/failure rate of most non-resource stock picking. 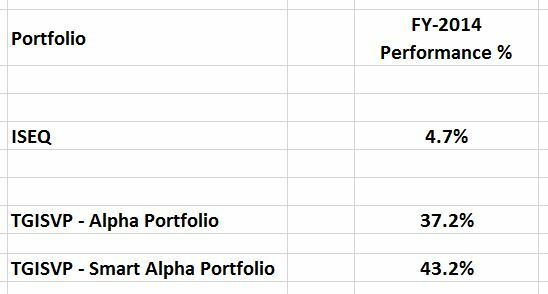 For 2014, the TGISVP Alpha & Smart Alpha Portfolios out–performed their benchmark return by 32.5% & 38.5%, respectively. You can’t short AIB. There is no borrow and subject to shorting ban. – hence valuation. Most obvious short ever but shouldn’t be in portfolio. Three great value shares to have owned! Though ZMNO wouldn’t necessarily have delivered a gain yet, depending on your entry point – please send me an email if you have any particular points to highlight, or questions/issues to discuss.